Dual booting is a great way to get the best of both worlds in modern computing 7 Reasons Why You Should (and Shouldn't) Dual Boot Linux 7 Reasons Why You Should (and Shouldn't) Dual Boot Linux Often, making the choice of installing Linux over Windows can be tricky to justify. But why not opt for both? Here are five reasons to dual boot and two reasons you shouldn't. Read More . But sometimes it can be a problem. One of the biggest issues is accessing data between operating systems. It doesn’t matter if you’re booting two or more Linux operating systems or you’re using Linux and Windows together. Operational issues can occur that will hit your productivity where it hurts. Fortunately, there are solutions. This is how you can share your data across dual-booting operating systems. Perhaps the most popular use for dual booting (as opposed to, say, switching to Linux completely) is to improve productivity. You want to use Linux, but retain a stake in Windows — there are apps that simply won’t run in Linux, such as Adobe Photoshop (although alternatives are available 5 Photoshop Alternatives You Can Run on Linux 5 Photoshop Alternatives You Can Run on Linux it is tragic that after all these years, the open platform of Linux still has yet to produce competing software that can really match Photoshop head-to-head. But powerful options are available... Read More ). Therefore, you need to share you data. Having a document available in one operating system but not the other isn’t going to make things easy when it comes to updating it. Rather than reboot into the second OS to edit the document, it makes sense to have it available in a central location. One of the key reasons for people abandoning their efforts in the Linux environment is a perceived lack of support for existing data. This isn’t the case, but if you can’t even get hold of your data to begin with, it’s going to seem tougher. The answer is simple: make things easy on yourself! Storing your vital personal data on an external device is one answer to this. Another is to have a dedicated partition on your hard disk drive (HDD), accessible from all operating systems. When it comes to sharing data between two Linux operating systems (also known as distributions, or “distros”), you can expect the best experience. There will be no clashes: both operating systems should be able to access the data without issue. As long as the apps are available to read the data, you’ll be able to view and edit documents, images, audio files, video files… whatever! It really is that simple. Unfortunately, things start to get complicated when you throw a Linux/Windows dual booting system How to Install Ubuntu on Windows 10: 3 Simple Methods to Try How to Install Ubuntu on Windows 10: 3 Simple Methods to Try There are many ways in which you can try Ubuntu. One of them is to install Ubuntu on Windows 10 using one of these methods. Read More into the mix. Although sharing data between Linux and Windows partitions should be straightforward, it can often be problematic. The first thing you need to do is plan: how many operating systems are you installing? Is there enough space for all of your personal data? Can it be stored in a central location? Once this has been sorted out, and the operating systems installed, it’s time to ensure the data is readable in each one. You’ll need to reboot several times to check. However, there are times when there is data stored in the personal directories of one operating system that you need to view from another OS. Fortunately, it’s possible to view files stored in a Windows partition from a Linux operating system. All you need to do is open your file manager, browse to the Windows partition, and browse for the data you need. In this situation, it’s wise to copy the data from the Windows partition into Linux to avoid file locking errors. But what about the other way around? What if you require access to a file you’re working on in Linux, but you’ve booted into Windows? It’s not as simple to browse an ext4-formatted filesystem Ext4 vs. Btrfs: Why We're Making The Switch [Linux] Ext4 vs. Btrfs: Why We're Making The Switch [Linux] Quite honestly, one of the last things people look at is which file system is being used. Windows and Mac OS X users have even less reason to look, because they really have only one... Read More from NTFS. Instead, you’ll need to find a third-party tool to read the file system for you. Ext2 Installable File System for Windows: This all but integrates the Linux file system with Windows. The result is a Linux partition that is browsable from Windows. DiskInternals Linux Reader: Taking a more synthetic approach, this tool from DiskInternals runs as a separate file manager. Data stored on an ext3 file system can be previewed or saved to your preferred Windows directory. Explore2fs: This is an older tool and you may have trouble running it in Windows 10. Like DiskInternals Linux Reader, it displays the contents of your Linux partition within its own file manager. My own preference is DiskInternals Linux Reader. Although a little slow, it delivers a useful preview of the data, which can save time when browsing for the right file. 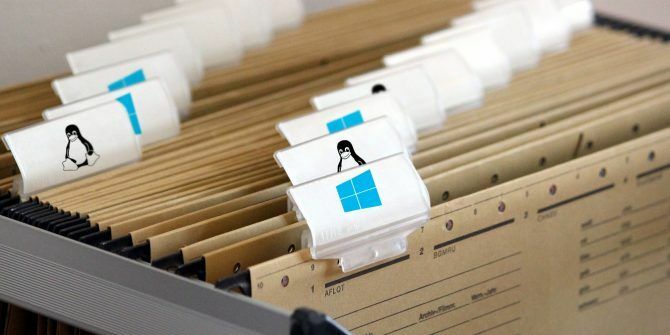 Data can be effortlessly copied from Linux into the Windows file system, enabling instant continuity. Be aware, however, that some files don’t like being transferred between file systems. Media files can suffer here, leaving you with a full-sized file that won’t open. Surprisingly, this problem isn’t limited to data originating in Windows. It can occur when transferring data from Linux to Windows as well. Whether you’re booting two Linux systems, or Windows and Linux together, ensure you have things set up right. This will avoid problems sharing data across systems, as well as avoiding other pitfalls. I recently discovered just how seamless transitioning from Windows to Linux Switch from Windows to Linux and Get Up and Running in Minutes Switch from Windows to Linux and Get Up and Running in Minutes Switching from Windows to Linux might seem complex, but it's easy! Here's how to your get important data and programs from one OS to the other. Read More (specifically Ubuntu MATE) can be and this was made possible by focusing on sharing personal data between both platforms. Fortunately, I had all the tools installed in advance; I had also organized my data some time ago to ease any such transition. And really, when it comes to sharing data when dual booting, ensuring your personal files are well-organized, and stored centrally, is probably the most important part of the puzzle. Are you concerned about getting dual booting right? Worried about accessing data? Or do you have a different solution? Share your thoughts below. When I had a dual boot Windows-Ubuntu machine I set up a separste partition formatted to NTFS since both oses cam read and write to NTFS and then set both Windows and Ubuntu to use the same user folders. They way I had the same Desktop, Documents, Downloads, etc. The same can be done with an exFAT partition. I was a bit surprised not to see this method mentioned in the article. Installing a driver in Windows to read/write to Linux (Ubuntu) ext2/3/4 partitions tends to corrupt the Ubuntu partition. Best to create a separate NTFS partition that can be shared between Windows and Linux (Ubuntu).